You can enjoy several Holy Week services at Belfast Cathedral this Easter. The recently retired Bishop of Aberdeen and Orkney, the Right Rev Dr Bob Gillies, will be the key note, guest preacher at two significant services in St Anne’s Cathedral, Belfast, during Holy Week. Bishop Gillies will preach at the Maundy Thursday Eucharist, starting at 7.30pm on the 18th April 2019 and the following Good Friday’s Three Hour Service, which runs from 12 noon to 3pm. Bishop Bob Gillies served all his ministry in Scotland, and was appointed Bishop of Aberdeen and Orkney in 2006, retiring in 2016. He currently serves on the National Board of the Church Army and is an Honorary Research Fellow in the University of Glasgow. Holy Week at Belfast Cathedral begins with the Palm Sunday Service on the 14th April 2019 which will be broadcast live on Radio Ulster at 10.15am (the congregation must be seated by 9.50am). Dean Forde said: “In a service specially prepared for radio, we shall share our Palm Sunday procession through the Cathedral. We shall then explore what the day meant for all those present on the first Palm Sunday, including the disciples of Jesus, the Passover crowds in Jerusalem, the ill-at-ease Roman authorities and the unsettled religious leaders. On Palm Sunday afternoon, St Anne’s will welcome members of the parishes of the Mid Belfast Rural Deanery (Connor Diocese) to the 3.30pm Evensong as they begin a Holy Week of shared services with the Cathedral. Mid Belfast Rural Deanery, of which the Cathedral parish is also a part, gathers together church communities including St George’s on High Street, St Luke and St Stephen’s at Millfield, St Michael’s and St Matthew’s on the Shankill Road, St Mary’s with Holy Redeemer on the Crumlin Road, St Mark’s at Ligoniel, Emmanuel and Holy Trinity at Ardoyne and Ballysillan, and St Columba’s and St Andrew’s at Whiterock and Highfield. From Monday 15th April to Wednesday 17th April, all are invited to Special Choral Evensongs at 5.30pm. At the heart of these Holy Week Evensongs, each night the choir will sing an anthem from the powerful St John Passion written by the contemporary composer Bob Chilcott. Evensong will also include a short meditation by the Cathedral clergy on ‘People of the Passion,’ and a congregational hymn. Key note preacher, Bishop Gillies will preach on Maundy Thursday and Good Friday. Good Friday will end with a Liturgy for Good Friday led by the Dean with the Cathedral choir starting at 7.30pm. On Holy Saturday, 20th April, the dramatic Easter Vigil Service will start with the lighting of the Easter Fire on the steps of the Cathedral at 8.30pm, and from the flames of the Easter Fire, the Pascal Candle will be lit. “Throughout the shared retelling of this world’s story, we shall each reaffirm the telling of our own baptismal promises, symbolised by the individual candles we shall each hold, lit from the fire of Easter resurrection. 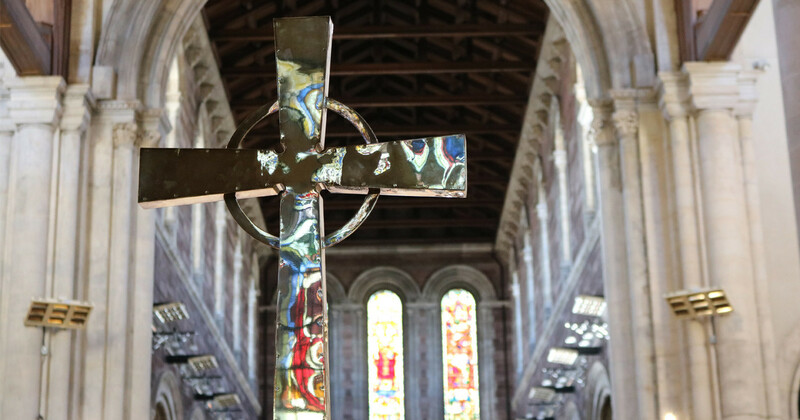 On Easter Morning, 21st April 2019, the Cathedral’s festival services of resurrection joy begin at 10am with the said service of Holy Communion for Easter Day in the Chapel of Unity. At 11am, the Cathedral Choirs will lead us in a joyful celebration of the resurrection of Jesus for our Easter Festival Choral Eucharist. Belfast Cathedral’s Easter celebrations will conclude with the beauty of Choral Evensong for Easter Afternoon starting at 3.30pm. On Easter Tuesday the Cathedral will once again throw open its doors from 11am for Belfast’s Biggest Indoor Easter Egg Hunt. This event will be supported by Jill Hamilton, Connor Children’s Project Development Officer, and a team of volunteers. “We can expect the Cathedral to be packed with children of all ages, hunting out Easter eggs from the hidden corners and creating Easter crafts at the activity tables,” Dean Forde said. Read more news from Belfast Cathedral on their website here.